Voices From The Edge - ZineWiki - the history and culture of zines, independent media and the small press. 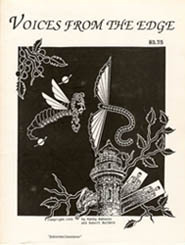 Voices From The Edge was a fanzine by Angie Underwood. Published by deMedici Press, in North Caroline, U.S.A., twelve issues of Voices From The Edge appeared in the early 1990s, dedicated to weird fiction, the supernatural and horror. Contributors of art work included Roberto Accorti, Duke Andrews, Robert Baldwin, Cathy Buburuz (Champagne Horror), M.B. Chavis, John Hitchcock, Sara Jane Mann, Russ Miller, James Parsons, Jamie Robertson, Bil Ruth, Marge B. Simon (Star*Line), Jack Stratton, and Mark Way. Covers were by Robert Baldwin and Cathy Buburuz, John Hitchcock, Skee Johnson, Sara Jane Mann, Jamie Robertson, Bil Ruth, and Jack Stratton. Contributions of fiction were from by Deidra Cox, Julie Christman, Michael Thomas Dillon, Vic Fortezza, Chris Fox, Sasha Fox, R. David Fulcher, R. Monk Habjan, Gerard Daniel Houarner, D.F. Lewis (Nemonymous), Jeffery Lewis, Barbara W. Malenky, Logan McNeil, April Merl, Russ Miller, Brian Mitchell, Michelle Owens, Lenora K. Rogers, Steven L. Shrewsbury, W. Gregory Smith, and Blair Wilson. Contributors of poetry included Maria Bassaro, Jeremy P. Bushnell, Jennifer Cranford, Chuck Daar, Holly Day, Wayne Edwards (Palace Corbie), Chris Fox, Winnie N. Frend, John Grey, R. Monk Habjan, Patricia Harris, John Hulse, Gianna LaMorte, Jack Micheline, Don Morgan, Michelle Owens, Andy Rose, Scorpion Sikes, Cara Silverstein, Chris Tannlund, Bob Tekley, Paul Weiman, and Sarah Wyman. Reviews were by R. Monk Habjan, Jonathon Perry, and Alexis Thonen. Comics and cartoons were by Duke Andrews, John Hitchcock, Jamie Robertson, Bil Ruth, Ken Staton, and Wendall Woodhams. Also featured were interviews with the bands Biohazard, Cathedral, Dead White & Blue, Fear Factor, Massacre, Mindhorse, My Sister's Machine, and Paradise Lost; artist Andrew Kerns, and writer David R. Addleman. Angie Underwood and deMedici Press also published the music zine, Noise!, the poetry zine Words, and the comic zine Comics From The Edge. This page was last modified on 16 September 2012, at 10:04.